Whew, okay. So, this weekend was crazy busy and this week will be a lot of the same. 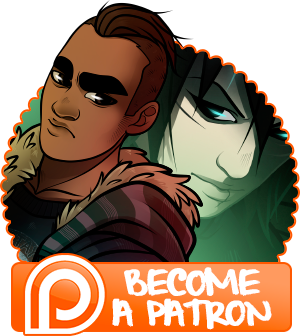 I’ve managed to get the buffer up to December 12th (and if you’re a $10 patron you can read all unpublished updates right now!). I also posted up some patron-only wallpapers and worldbuilding about the Fiah that you can check out and download for as little as $1/month. They can be found with the previous wallpapers and worldbuilding for the Makkuroa, and will be joined next weekend by the Hlurcht! I’m going to be spending the rest of the week packing things into boxes and hauling furniture around at night, but during the day the plan is to start and finish all three of December’s wallpapers, and have a new poll up for the rest of you for January by Friday. Another shipment of books went out on Friday and we’ll have a giant one going out this upcoming Friday as well. Anyhow, I’m off to a strategy meeting with Cory on the best way/order to move all of our stuff over! See you then!